Edgemont Wrestling Club – Building Champions on the mat and in life. WE build Champions on the mat and in life. Help us make it happen now! Can you help us keep building Champions? Your gift is what makes it happen - all donations are fully tax-deductible! Edgemont Wrestling Club Inc. is an independent non-profit 501(c)3 corporation. We are not part of the Edgemont UFSD, but our sole purpose is to raise money to support the ﻿Edgemont﻿ Wrestling Program. Each year Edgemont Wrestling Club, Inc. helps cover costs of these many initiatives that our school budget does not - all through the generous support of our wrestling family - parents, alumni, fans and supporters! This year is no different - we need your to help make a difference! And we’ll do it the same way we always do - together. Edgemont Wrestling isn’t really about wrestling. 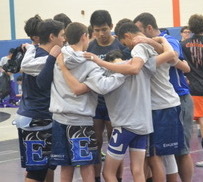 Edgemont Wrestling is a family - past, present and future - that ties us all together. Edgemont Wrestling is a community of caring parents, wrestlers, coaches, alumni, fans and friends and you’re a part of that. And it’s an exciting time to be involved! Edgemont Wrestling is arguably one of Edgemont’s most successful athletic programs and one of the strongest wrestling programs in New York. But, much more than that, you and I and the rest of our community realize that Edgemont Wrestling is about developing men and women of character. Our program’s mantra, “Building Champions on the mat and in life,” frames everything we do. As you know, the winning is just a by-product of the process. And the process uses wrestling as a vehicle to build confidence, accountability, work ethic, resilience and grit. The process teaches our wrestlers how to put the success of the group ahead of their own and how to fight for something bigger than any one of us. We strive to make Edgemont wrestling one of the most rewarding and challenging experiences in our wrestlers’ lives, so when they graduate and move on, whatever life throws at them seems that much easier to conquer, knowing they’re capable of so much more than they once thought possible. Look at the current or former Edgemont wrestlers in your life. It’s plain to see what they’ve gained from the program, helping them become better men and women and better members of society. In the past several years, we’ve had six League Championship teams, three New York State Champions, seven Section 1 Wrestler of the Year Honorees, 12 All-State Wrestlers, 25 Individual Section Champions, 53 All-Section Wrestlers and dozens of All-League athletes. Our wrestlers have gone on to attend top colleges and universities around the country over the past few years, such as Harvard, Princeton, University of Pennsylvania, Duke, Columbia, MIT, Bucknell, NYU, University of Chicago and many others. Our alumni have positive impacts in many industries and all walks of life: medicine, law, education, finance, entrepreneurship and public service, just to name a few. It’s fitting that the same family orientation, teamwork and commitment to shared sacrifice that we develop in our student-athletes is the very thing that keeps our program moving. To make our program as impactful and successful as it is takes a lot of help! Head Coach Pete Jacobson, Head Assistant Coach Bill Magner, Assistant Coach Brett Pastore and our six other volunteer coaches that work with our high school athletes. These men give so unselfishly of their time, all because they know what the sport gave them and they're passionate about our mission of paying it forward to others. But it doesn’t stop there: our alumni and their parents, our parents of current wrestlers, our fans and supporters: you’re absolutely and undoubtedly the x-factor that has transformed a team into a family and a sport into a transformational experience. We literally couldn’t do it without all your support. The other game-changer for our program is our all-encompassing philosophy. We all take pride in being a part of the single-most comprehensive program in Edgemont or in New York State for developing successful student-athletes and even better people. Our coaches and our program strive to develop the athlete and the whole person and relentlessly attack that mission from every angle, utilizing every opportunity available. The scope of support we provide to build our student-athletes into Champions on the mat and in life is unprecedented. And so is the support we need from our wrestling family to keep fulfilling our mission. 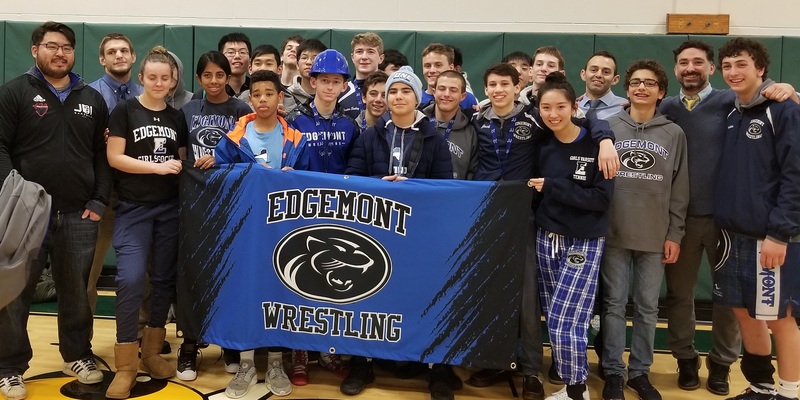 Edgemont Wrestling Club Inc. is an independent non-profit 501(c)3 corporation whose sole purpose is to raise money to support the ﻿Edgemont﻿ Wrestling Program. Please consider a tax-deductible donation! Make a difference for years to come. Not ready to help right now? No problem! Thank you to our AWESOME donors! Your invite to our 2019 Candlelight Inn BBQ!